Level 1: Garden and patio, outdoor dining area, kitchen, private WC , living room with entertainment corner, master bedroom. Level 2: Secondary sea view bedroom/living room, indoor dining area. 1 double, king size bed 160*200cm with memory mattress. 1 double king size bed 160*200cm in a sea view attic, designed for children, small people or enthusiasts. Extras: Access to the sunset terrace (2nd floor), private parking. The center of activity for this apartment is the sitting areas by the garden and the covered patio. The Venetian character of the building can be observed better from the outside and the use of the private outdoor space can transform your overall experience to a memorable one. Hidden cisterns, pillars, arches of all sizes, pebble stone patters, stone carved details they all encourage you to rediscover the history of the monastery. Jasmine, basil, Japanese cheesewood, lemon grass, bougainvillea are amongst the plants that are meant to provide colour, aroma, shade and a healthy and relaxing environment. This enclosed area is hidden from the inquisitive eyes and with the thick walls it is protected from the activity in the area, thus it offers privacy and serenity to its guests. The sunset (west) terrace on the top floor is a common area that guests can take advantage of during the summer time. Provided that it is not reserved for private use, the top floor is ideal for breakfast in the morning, a drink in the evening, stargazing late at night or a sunbath anytime during the day. The kitchen originally a covered, open area as part of the cloister has lost its original character in the ottoman period when a small room with a domed ceiling to be used as a rest room was constructed in the middle of the cloister. The stone carved opening to the east indicates that many years ago this part of the building was of particular significance. As in all apartments in San Salvatore, the kitchen is central to our idea of living. Overlooking the garden from the arched openings, this bright and full of history space encourages the guests to make the most of their stay by taking advantage of this facility. The two adjacent long, dome roofed constructions at the south-east part of the building are the last relics of the past on this side. What today serves as a bathroom is the one that is better preserved through the years, while it's original use is still unknown. The bedroom we enjoy the most. Fall asleep gazing at the harbour in front of you. Ideal for children. This bedroom is designed to recreate the old Turkish “oda” system of split level sleeping areas using a half loft to create the extra space. Height in the attic : Main area 210cm, bed area 160 cm ( Amphitheatre-like design). From the raised bed on the half loft you can enjoy some exquisite views over the old harbour of Chania while curled up in the comfortable double bed, or you can enjoy the same view while sitting in the extra seating area provided on the half loft. The half loft is also equipped with a 40''4k TV for movies (Netflix), Youtube videos, music and local channels. Comfortable king size bed, memory mattress. The apartment offers ample space for up to 4-5 guests which makes it ideal for families. The main living space on the floor level offers a comfortable and relaxing sitting area, while the more vivid area in front of the windows in the attic can be used as a working space or a small dining area. "Πολυ ιδιαιτερη διαμονη διπλα στο παλιο λιμανι Χανιων. Πολυ περιποιημενος και ησυχος χωρος σε ανακατασκευασμενο μοναστηρι, ακριβως διπλα στο παλιο λιμανι των Χανιων. Επιπλωση με γουστο, πληρης εξοπλισμος για προετοιμασια φαγητου, πρωινου, κλπ"
"We really enjoyed our stay at the San Salvatore on our August trip to Chania. We booked the Ground floor basement apartment and found it simple but charming, very spacious, well-equipped and comfortable. ... We thought it was good for the price, especially during high season and I really cant say enough of the great location. The old monastery building that houses the apartments is located right at the edge of the old town, just a few steps from the charming narrow streets of old Chania filled with restaurants, museums, shops and cafes and of course the beautiful old port. It was wonderful to enjoy the busy old town but still feel immediate peace once you step into the garden inside San Salvatores old walls. The apartment is also just a walking distance away from Nea Chora, one of my favourite parts of town with nice fish taverns and the nearest beach of the area. Our host, Irene was very helpful and hospitable during our stay and we had the pleasure to have a nice chat with her every now and then running into her by the garden in the peaceful courtyard. Irene always made sure we had all we needed for our apartment. We also had the pleasure of sometimes meeting Irene's playful dog having fun around the garden. The dog was very well behaved and we had no problem with her at all. Thank you Irene for the lovely stay! 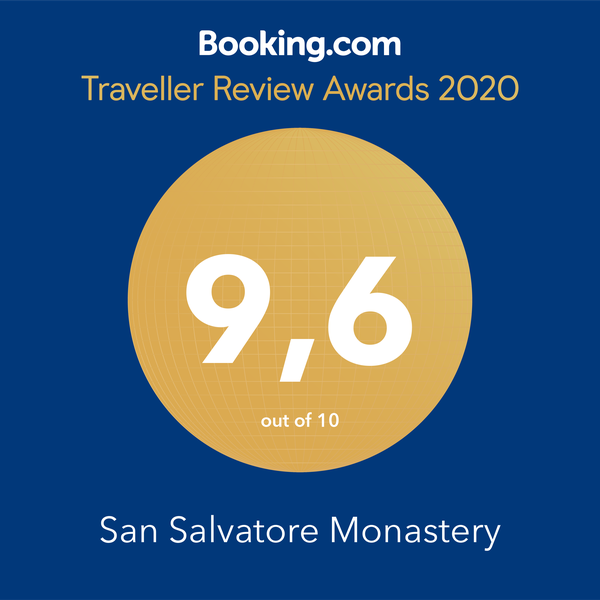 All in all, the San Salvatore basement apartment is a great place to enjoy an affordable but good quality stay in the old town. Bastion of San Salvatore , Archaeological Museum, Nautical Museum, Nea Chora beach.